Here is another shot of a bike I saw sitting at the Broken Spoke Saloon in Sturgis. I took a bunch of shots and really wish I would have taken some notes. As I look at these pictures I would like to give the proper credit to the builders and riders. But then again, let's see I was in Sturgis after riding all day, we had just stopped for a our first beer and um, well my note book was not handy. I guess I am glad I got some pictures to post and talk about. This bike is an extreme combination of low slung seat, big engine, super twisted and fabricated frame, highlighted by a tall front springer front end. Check out the way the tube work is done around the rear section of the seat, the rear swing arm and the fender supports. Wow someone got twisty with the tube bender, great work guys. 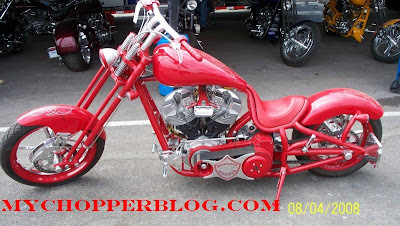 The little extras like the powder coated rims or the bright red highlight around the front head light, make this one seriously red machine. I am not a fan of the big wide open belt primary but, if you have a motor that big I guess you need some way to control and transfer the power from the engine into the transmission. All in all a great combination of bright red, and super shinny chrome. 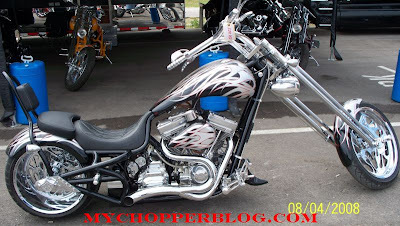 Here is a noteworthy shot of a super custom Softail. It was built for the Haulmark trailer company, thus it has the bright orange paint and the company logo on the tank. Haulmark makes trailers, to help with the motorcycle shipping of your precious bike, that is if I can't get on it and ride it to the show. I am impressed with all the work welding and building and filling in the fender and body on the rear of this bike. Talk about some serious fabrication work. I wish I could work with sheet metal like this. Once I get below about 3/16 or 1/4 thickness when fabricating I am done. It just doesn't seem to work for me. I can't weld it, bend it or make it look like anything but sludge. Well anyway look at how the frame moves forward and into the gas tank. Then check out how the gas tank on the front flows right into the frame. Someone did a very nice job on this bike. If you know the fabricator please let me know and I will give them proper credit. This thing looks like it has a big old Engine as well. The big tall jugs are good looking, and yes I am talking about the engine cylinders guys. While I was wandering around the Broken Spoke Saloon out North of town I started taking pictures of Custom Bikes. Here is a shot of a low single seat Soft tail. 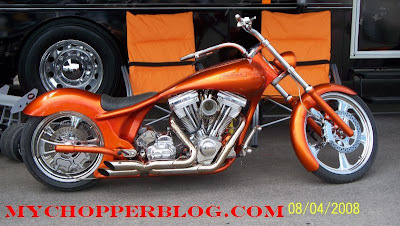 I am thinking this is a custom of some kind, the chain makes me think it is not a Harley Davidson. The bike does have some of the looks and features of a Fatboy, but I would guess it's not an official Halrey Davidson. 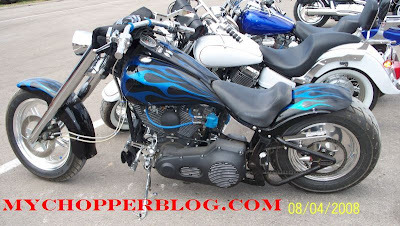 The chain also make me think that motor maybe a fire breathing monster, not just a 80 cubic inch evolution HD motor. The flames on the tank are very cool, I like them but think if I was putting them on my bike I would make them ghost flames, so they were not very visible. The other cool thing about this bike is the the way the handle bars are pulled back. They really change the look of the front, bringing it down and back. I bet it makes this motorcycle feel low and lean once you climb on. Well my hat goes off to who ever owns this bike, I like it and think the overall look is pretty damn good, and I bet it gets up and goes. The new old Broken Spoke Saloon in Sturgis. 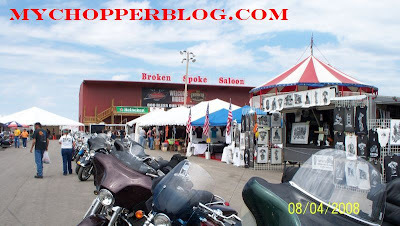 Here is a picture and a story about The New Broken Spoke Saloon in Sturgis South Dakota. I say it is new because is has only been around for 3 years or so. I also say it is new because I didn't know about it until this year and I found it completely by surprise. So let me tell you about the surprise, we all love surprises right. This year we took a nice long motorcycle ride the first week in August and had a plan to tour way up north and drop into Sturgis from the North Western direction. 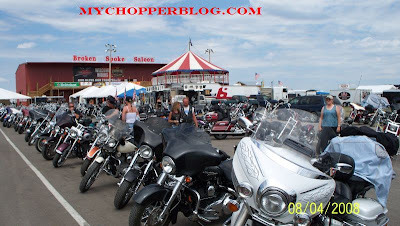 We we driving the Highway across the middle bottom area of Montana, and approached Sturgis, through Belle Forche, and then looped east around Sturgis and down the bear Butte road into the Buffalo Chip. Well after a nice long days ride were could smell the cold beer and Sturgis Dirt and we were getting really close to the chip. Well then what to our wondering eyes did we see, a big new Broken Spoke Bar, about 3 miles north on the Bear Butte Road. What the?, When did they build that, we gotta stop flashed into our tired minds as we slowed and pulled in. This is when the fun started, we were immediately sent down the row of vendors and towards the bar, Sweet we will get a front row parking spot, no wait, What, I was driving right through the bar, following a string of other bikers. How cool is this, Hit Sturgis and drive right into the Bar. Hell Ya, we had arrived. Once we settled into a row of bikes, I snapped this shot and headed for the Bar to see what else we could see. The trip was off to a great start and this leg of the journey was getting better all the time.